How and Where to Buy Bystolic? Order Bystolic online through CanadianPharmacyWorld.com at reasonable prices. Our Canadian International Pharmacy provides OTC and RX medications from Canada and other countries around the world at huge discounts. If you want more information or need further details, please call Customer Service at 1866-485-7979. You can also follow us on Twitter and Facebook. Are there Alternative Names for the Brand and Generic Bystolic? The brand name Bystolic comes from UK also called Nebilet manufactured by A. Menarini Farmaceutica Internazionale and Canada manufactured by Forest Laboratories. The generic Nebivolol comes from India also called Nebicip manufactured by Cipla. What Dosages and Forms is Bystolic available in? •	10mg – pink color triangular shaped tablets with the pill imprint FL on one side and 10 on the other side. What is Bystolic used for? 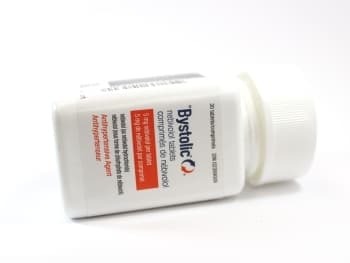 Bystolic (Nebivolol) is a prescription medication that is used for the treatment of high blood pressure. Bystolic belongs to the group of medications called beta-blockers that affect the heart and circulation. By lowering the blood pressure, you may lower your risk of a stroke or heart attack. Nebivolol works by blocking the action of certain natural substances in your body such as epinephrine on the heart and blood vessels which lowers heart rate, blood pressure and strain on the heart. Are there any Precautions or Drug Interactions for Bystolic? You should not take Bystolic if you are allergic to Nebivolol or if you have any other allergies. Before you start taking this medication, talk to your doctor about your medical conditions and about all the medications you are currently taking including OTC and herbal medications. This medication may make you dizzy. You should not drive or do any activity that requires you to be alert. Limit alcoholic beverages. This medication should not be used during pregnancy unless it is clearly needed. It is unknown if this medication passes into breast milk. Talk to your doctor before breast-feeding a baby. Bystolic should be stored at room temperature away from light and moisture away from pets and children. This medication should not be stored in the bathroom.